Are we in New York City? Really? By the "Christmas Tree in the Woods"
Every year since they were in grade school, the Chef and I have taken our two kids up to New York City’s largest park, Pelham Bay Park, for a bracing hike on New Year's Day and a warming lunch at the City Island Diner afterwards. Even as they have become college students who are increasingly hard to rouse and likely hung over on New Year's Day, they still come with us, and for that I am so grateful. It's a short 20-minute trip to the gigantic Orchard Beach parking lot and a five-minute walk into the park, and soon we are hiking along wooded and coastal trails. On our way we pass landmarks we have come to know and love: the glade of Norway spruce trees, the dog cemetery, with its crude stone circle memorials for beloved pets, the Christmas tree in the woods. Every year, this spindly pine is bedecked by a ghostly hand with a few red globes and glittery pine cones, and every year we take family photographs in front. If we were the kind of family that sent out photo holiday greetings, these would definitely make the cut. “Metamorphic!” she pipes, up. “Correct!” These rocks were created about 450 million years ago at extreme high temperature when the existing rock layers were flowing as liquid, and indeed they have beautiful swirling patterns. Across the bay is the narrow islet with its septet of glacial erratics, deposited from bedrock during the last ice age. I swim to it in summers or we walk there if the tide is low. Surveying the landscape the Chef always says, “Can you believe we are in the Bronx? Still in New York City?” and, indeed, we could well be in coastal New England or Nova Scotia. But my thoughts spiral beyond familiar earthbound places. Standing on garnet streaked metamorphic rock, I feel the same way I do in the country when I look at the starry sky: miniscule within the universe’s expanse. Yet, scattered on the rocks, my family is a bulwark against feelings of insignificance; I think of poet Czeslaw Milaw’s paen to the importance of our small, human connections, “My-ness,” and “feel such sweetness, being here on earth,/to celebrate our little my-ness.” But two in my “little my-ness”—my son, my daughter—are peckish. 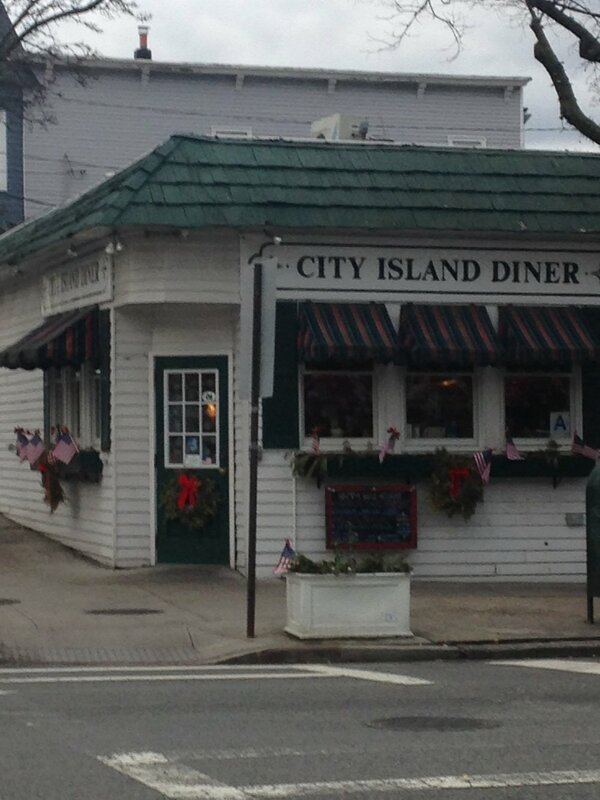 And we know the City Island Diner closes at 3:00PM on New Year’s Day. We hoof it back to the car, and son and daughter both whine “noooo,” when the Chef wants us to extend our hike over the sand on Orchard Beach. If our rocky isle and cove in Pelham Bay Park is reminiscent of Peggy’s Cove in Nova Scotia, then City Island, just a ten-minute drive away, is like a New England sea side town in miniature (it’s only 1.25 miles long and a few blocks wide), not a cutesy tourist trap but a real working harbor town. On the southern end is a cluster of immaculate Norwegian cottages with steep pitched roofs from the time Scandinavian and German shipbuilders lived there. Now, there is no shipbuilding, but marinas, dry docks, boat repair outfits, and lobster houses shuttered for the winter. The main drag, City Island Avenue, looks deserted on our New Years Day visits, so it’s a relief to step into our usual green booth at cozy City Island Diner, see the same servers, the same tiny etchings of boating themes on the wall. After lunch, we again follow tradition: the Chef and my son walk to the Pelham Cemetery on the Eastern shore of the island and my daughter and I go to whatever shops are open. Just as there are natural treasures of Pelham, there are man-made treasures in quirky shops, like Kaleidoscope Gallery, which is an overstuffed hodge podge of CI souvenirs, handmade and imported jewelry, kiddy toys and second hand finds. I bring home a used $5.00 necklace with a Chinese character and a $7.00 bottle of Egyptian musk essential oil. One year, I bought a brick imprinted with ghostly images of island houses. Back in the car, the kids, exhausted from their New Years’ revels, fall asleep with mouths agape. I can remember looking back at them sleeping in their car seats. I text pictures from our hike to a friend who texts back “JELLUS” bemoaning how hard it is to get her college aged boys to go anywhere as a family unit. “It’s cuz we started tradition when they were little,” I text her, and I feel a surge of gratitude for the Chef, for he is the one who ingrained these traditions into our “my-ness:" the nightly three course family meals, our October hike in Rockefeller State Park, an election day hike and this New Year’s day hike. By establishing these family traditions early they became like any habit, never something you must “resolve” to do, just a step you take into the brand new year.